At least 45 cases of fraud involving state-subsidised houses in Du Noon have been opened with the Hawks following community meetings called by the investigations unit.The investigation by the Directorate for Priority Crime Investigations, commonly known as the Hawks, follows a Parliamentary request to clamp down on the fraudulent sales of state subsidised houses in Cape Town. The Hawks began the investigative process on February 8, focussing on Du Noon and Delft. At a meeting on February 8, 33 residents came forward with “eligible” cases pointing to fraud being committed in state-subsidised housing schemes, said provincial police spokesperson Andre Traut. These included people who were receiving water and electricity bills for houses they had never occupied; having title deeds for houses that had not been handed over to them; and those who had never been given occupation of a house despite being in receipt of a letter from government that one had been awarded to them. And at a second meeting this Saturday, a Hawks investigating officer unofficially confirmed that they had filed “more than 12 eligible cases”, bringing the total to more than 45. Phumzile Zenzwa, 41, is one of the residents who filed a case on Saturday. Zenzwa said he had been renting a one-roomed shack in Joe Slovo informal settlement near Milnerton since 1999, which he shared with his son and his girlfriend. He said last year, when he went to check the status of his housing subsidy application at the City’s Blaauwberg municipal office, he found that his application had already been approved, with a house in Du Noon’s Jasmine Close assigned to him. “I was shocked when I learnt that I have a house. All along I have been renting a shack for R350 a month,” he said. He now has a title deed, but has not set foot in the house, which is occupied by someone else. He said with the Hawks stepping in, he hoped justice would prevail and he would finally receive his house. The investigation follows disturbing findings by the provincial Human Settlement Department late last year. A four-month investigation by the department in Philippi’s Samora Machel and Khayelitsha’s Mandela Park, revealed that “up to a third” of all state-subsidised houses in those areas could be illegally occupied. The report noted that in Samora Machel 1 457 out of 4139 (35%) houses were potentially illegally occupied. Similarly in Du Noon in 2008, the then Provincial Department of Local Government and Housing appointed research company Professional Mobile Mapping (PPM) to conduct a “blitz occupancy audit” in Du Noon. PPM randomly selected 505 state-subsidised houses out of 2 969 in Du Noon. The survey found that 201 occupants were registered on both the housing subsidy system and deeds office, 61 occupants were only registered on the housing subsidy system, while 235 occupants were not registered on either the housing subsidy system or at the deeds office. One occupant was only registered at the deeds office and seven houses were occupied by foreign nationals who could not prove ownership. The report stated that Community Development Workers (CDW’s) who helped conducting the audit found that some people had unlawfully sold their state-subsidised houses, some rented their house out while others simply swapped houses amongst each other. The CWDs also alleged that contractors appointed to administer the registration of state-subsidised housing were “corrupt”. In March last year the SA National Civic Organisation (Sanco) Du Noon branch embarked on their own clamp-down of fraudulently sold state-subsidised houses and found eight houses had been sold illegally. Four of these appeared to have been sold by a self-styled property agent who is currently being sought by the Police after cases were opened against her. Du Noon ward councillor Lubabalo Makeleni, who was then Sanco coordinator, said he welcomed the involvement of the Hawks. He said at the first community meeting called by the Hawks, “people came forward saying they received water bills for a house but they are staying in shacks”. Parliament’s Portfolio Committee on Human Settlement chair Nomhle Dambuza said the call to investigate the occupation of state-subsidised houses came after the committee visited four provinces in 2009 and found that in many cases the people occupying state-subsidised houses “are not rightful owners”. She said the Human Settlement Department reported back to Parliament after conducting an occupancy study in four provinces but they had to re-request that the study be conducted in all provinces. “The Department of Human Settlement should conduct a full occupancy audit of who is occupying state subsidised houses and what are the reasons,” said Dambuza. “We want to know what the actual problem is. Why the houses are not occupied by rightful owners”. Although the Western Cape Department of Human Settlements was unaware of the Hawks investigations in Du Noon and Delft, spokesperson Anthony Hazell said they welcomed the investigation. I received a message from a friend in Cape Town saying she desperately needs R 50 000.00 to put a deposit down on an RDP house. How do I check or how does she check the legality of this before handing her money over? She has been living in a shack for over 15 years and never managed to get her name down even on a waiting list. Her shack and all its contents has burnt down numerous times. She has a child under 5 and fears for his life.How does she legally get on a waiting list for an RDP house? She’s welcome to pay us a visit during the week. MY WIFE APPLY FOR AN RDP HOUSE FROM 1996 . AND STILL WAITING . 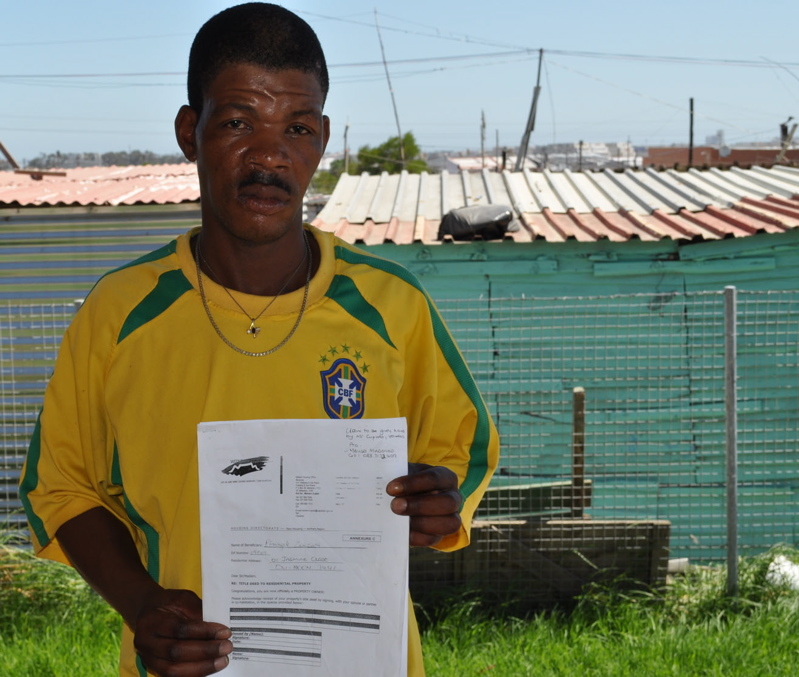 HIS BROTHER APPLYED IN 1997 AND HE GOT THE LETTER THAT TELLS HIM TO COME AND CHECK FOR HIS HOUSE . QUESTION IS HOW ITS THIS WORK . I would like to know how or where to apply for a subsidy or an rdp house? Furthermore I would like to know where I can purchase a piece of land so that I can build my own house as someone told me if you own a piece of land you can qualify for a subsidy. I will appreciate all responce. Regards Aden” Khayelitsha” Cape Town. I ve been on the waiting list since 2004 and all my friends that applied with me for these houses got a house,except me.Now im renting a RDP house from a guy and his charging me R1700 a month i am a single mother of 3.What i want to know is,is it legal to rent out a rdp house and am i gonna be in trouble if sources should find. Is it a legal Procedure to pay for the builders who are building the house becouse in my understanding these RDP houses are for free,But am seeing people opening up Groups called Federation where you are entitled to only recieve Facebricks,Limited Cement,Sand.other than that you pay for the people building the house you buy out of your pocket :Sink, Bothroom kit, Cabling and the silling inside. My question is? Is that the legal Procedure? of which the was no consultation before hand as to what is the reason behind their staff number – 10033394 what do we do in a scenerio like this.thanks. i will highly appreciate your response on my email address. Hi,my question is with regards to (a)If a relative has passed on,whom was an owner of a RDP house,would it then be legal for a family member to inherit the RDP house. (b)If the family member is in fact allowed to inherit the RDP house,but for occupational reasons lives far away from the inheritted RDP house,is it possible for the department of housing to grant them another available RDP house closer to their occupational area & swop with their inherrited house(c)What does the RDP ownership rule say about the sale of RDP housing. I stay in Makaza Khayelitsha. In 2009 our previous cnllr sold plots that were supposed to be given to back yarders. the youth stood and said it’s enough about corruption.the youth finally exposed him. Now those people who corrupted the plots formed PHPs in order to get subsidies and they were approved though the City officials new those people corrupted the plots. there is a big fight in Makaza about those plots.we need the HAWKS to help us expose those City of Cape town officials who caused a big violence and fight against one another. i am a backyarder and i will never let people took away what is mine. i also have a right to own a house. the previous cnlr case is still on but his nephew is still out there corrupting still. hi I am in a process of buying an Rdp House from a guy who dont need it, has had title deed for more than 8 years, is it legal for the house to be sold at this period? Eight years is the standard period during which a state-subsidised house may not be sold, if the current owner has had the title deed for more than eight years then he may legitimately sell it. However, it might be worth approaching a legal advice office for peace of mind. Angry Khayelitsha residents prevented an RDP housing initiative from being built as they claim the houses were obtained by beneficiaries through corrupt means. As the construction company, responsible for the building of the houses was prevented last week from working, beneficiary Nomfusi Ntakana’s dream of moving into a brick home has collapsed. Ntakana claims it’s the third time that the construction of her house has been stopped by community members. Residents said they had evidence that plots were sold by their ward councillor and some of the ward development committee members to relatives and friends. She said the residents were refusing that she be built a house, even though she’s “been on the waiting list for 10 years”, because they believe she bribed her way onto the housing list. A fuming Ntukana said on Friday that residents destroyed her house again, minutes after the contractor built the foundation. “I am being accused of bribing my way onto the beneficiary list. I told them I got the house from community leaders. “I am living in fear. My children are being threatened and intimidated,” she said. Three people have been arrested after she opened a case of damage to property and intimidation. Residents say they have identified about 25 houses that beneficiaries allegedly got though corrupt means. Resident Elliot Foji confirmed that residents had stopped many houses from being built. Any reply on my query…. Hi Khwezi. We’ve sent questions to the City and are awaiting their answer. – Ed. Thanks for the follow up will hear from you..
Another question what procedures to follow when you decide to build for yourself using the subcidy money eg.Money gets deposited to Builders whare house the u select all the material on credit is that possible other than joining those groups which end up robbing people of their subcity money…? Your help will be highly appreciated thanks. Hi i applied for an RDP house in 1996 up until now i havent received any.now i dont know to who do i have to blaim. Hi I would like to find out how does 1 query a ERF document that has been amanded with wrong information the owner of the House has been captured on the ERF as owning 50% and daughter 50% where it was never concluded in that manner the doughter was register as the beneficiary in case the owner has passed away.. Thanks your Response will be highly appreciated. Am awaiting feed back regarding my Question about the wrong captured info on ERF number and the details within the document.. IN SAMORA MARCHEL :: I have struggling for years. Help me please, I don’t know what to do. I bought a house and unfortunately the seller died before we changed to me. I have been in the house since 2006, see attached documents. Just for it to be in my name. FOR AN APPOINTMENT CALL ME OR EMAIL OR SMS, I WILL COME TO YOU PERSONALLY.